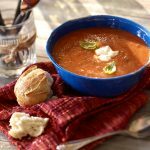 Looking for a creamy soup with a kick? 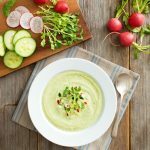 Try this creamy cucumber soup with fresh jalapeño to deliver a little kick of heat. For a contrasting texture, add some cucumber salsa as a garnish on top to finish it off. Melt butter in a medium pot over medium heat. Add onion, jalapeño and stir to cook until onions are translucent. Add diced cucumber and continue cooking for an additional 5 minutes. Pour in stock and bring to a boil. 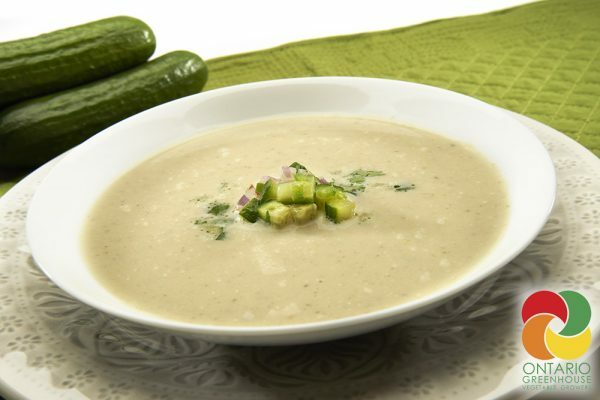 Reduce heat and simmer for approximately 20 minutes covered until the cucumber is soft. Puree the soup in batches in a blender (or use a hand held blender right in the pot). Return pureed soup back in the pot and add cream. Heat through over low heat. Taste and season with salt and pepper.